Use this recipe as a road map, making changes based on what you have on hand. Instead of corn, beans, and spinach, it might be sautéed mushrooms or sweet potatoes or zucchini or butternut squash. If you have a few dried chiles to use up, toast them, hydrate them, and make a chile purée to sub for the chili powder. The same flexible vibe goes for the cheese (use any combination of good melting cheeses you like) and accents. Want to throw in some toasted almonds? Go for it. Have a few strips of roasted peppers lingering in the fridge? Use them, too. I draw the line, however, at the tortillas — make sure to use corn instead of flour (though they can be white or yellow). Garnishes complete the dish, bringing fresh flavors and contrasting textures to the plate. Start the filling: In a very large sauté pan over medium-high heat, heat about 1 tablespoon olive oil until shimmering. Add about half of the onions and ½ teaspoon salt and cook, stirring often, until softened, about 3 minutes. Add about a third of the garlic and cook, stirring constantly, until fragrant, about 30 seconds, then add the corn and cook until heated through, 4 to 5 minutes. Off the heat, add the beans and spinach, and toss until the spinach wilts, about 2 minutes. Scrape the mixture into a medium bowl and set it aside. Prepare the sauce: Wipe out the skillet, return it to medium-high heat, add another tablespoon of olive oil, and heat until it ripples. Add the remaining onion and ½ teaspoon salt and cook, stirring frequently, until softened, about 3 minutes. Add the remaining garlic, chili powder, cumin, coriander, sugar, and 1 teaspoon salt, and cook, stirring constantly, until fragrant, about 45 seconds. Add the tomato sauce and broth or water, stir to blend, and bring to a strong simmer. Reduce the heat to low and simmer, stirring occasionally, to blend the flavors, about 15 minutes. Taste the sauce and adjust the seasoning with additional salt and black pepper, if necessary (you should have about 3½ cups). Finish the filling: Add ½ cup sauce, most of the cilantro, and 1 cup cheese to the bean and corn mixture, and mix well. Taste the mixture and adjust the seasoning with additional salt and black pepper, if necessary. Evenly coat the bottom of a 9-by-13-inch broiler-safe baking dish with ½ cup sauce, and set the dish aside. Preheat the oven to 375 degrees. Place the oven rack in the middle of the oven. Warm the tortillas: Fan about half the tortillas out on a large baking sheet, spray both sides lightly with cooking spray, and bake until soft and pliable, about 3 minutes. Repeat with the remaining tortillas. Roll the enchiladas: Working one at a time, place a warm tortilla on a work surface, spread about ⅓ cup bean and corn mixture down the center, roll tightly, and set it, seam side down, in the baking dish. Repeat to fill and roll all the tortillas, setting them snugly in the baking dish (you will have to fit about 4 enchiladas down the sides of the dish). 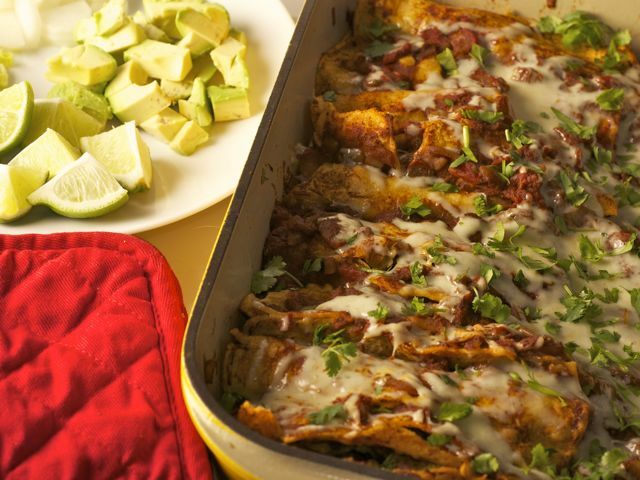 Bake the enchiladas: Pour the remaining sauce over the enchiladas and spread to coat each evenly. Sprinkle the remaining cheese evenly over the enchiladas, cover the dish loosely with foil, and bake on the upper rack until heated through and the cheese is melted, about 35 minutes. If desired, set the oven to broil, move the rack up, remove the foil, and broil briefly until the cheese browns slightly. Sprinkle with the remaining cilantro and serve, with any of the optional garnishes you like.